Welcome to GIVEsmall. This two-week online giving campaign is Cancer Lifeline’s attempt to ramp up attention towards GiveBig, a big deal regional online one-day of giving powered by our friends at 501 Commons. On that Wednesday, May 8 we hope to raise $15,000 and we have a $10,000 challenge which means the first $10,000 will be matched dollar for dollar. So why GIVEsmall, you ask? GIVEsmall gives us the opportunity to demonstrate how small gifts – $30 or $50 – can add up fast and help us continue to keep our programs free and accessible to all people living with cancer. So our week one goal of 10 $30 gifts or $300 will help us fund two months of a support group meeting. If you’ve ever visited Cancer Lifeline’s offices, you were likely greeted by one of two office dogs: LouLou, a bossy Corgi, and Roo, a mellow chihuahua mix. Who better to personify GIVEsmall but these two larger than life beings! However, the true motive behind all this social media online giving stuff is to create awareness of our programs and make sure that people know how to access them. You can check back with us on our blog roll to monitor our progress. For each gift, we’ll add another dog photo commemorating our successes. 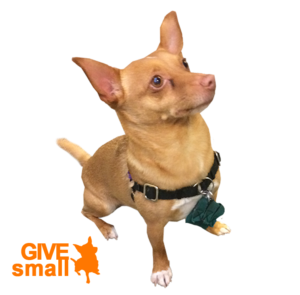 To donate to GIVEsmall, click this link.